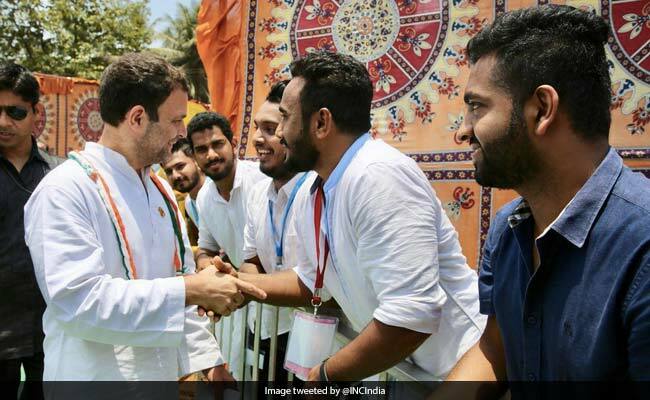 Karnataka Election LIVE Updates: Rahul Gandhi Reveals Poll Manifesto, Calls It "Karnataka's Mann Ki Baat"
Karnataka Assembly Election: Yesterday Rahul Gandhi had held a road show in Ankola, while PM Narendra Modi gave a speech to BJP party workers in the state via video conferencing. 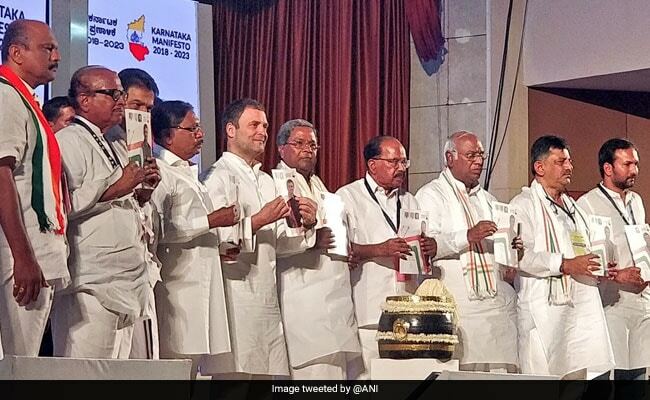 Karnataka Assembly Election 2018: Rahul Gandhi launches Congress' election manifesto in Mangaluru. Bengaluru: The campaign for the Karnataka Assembly election has picked pace ahead of voting day on May 12. 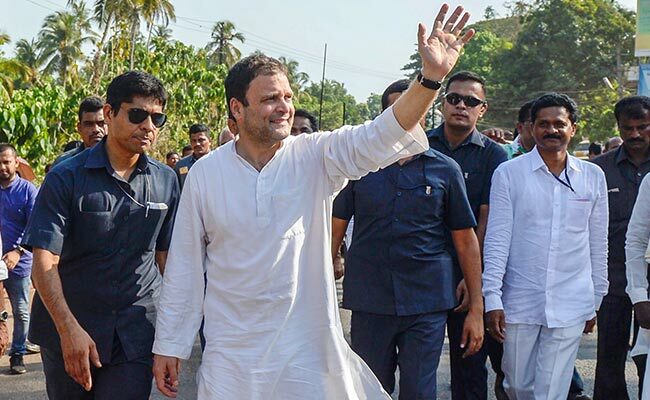 Congress president Rahul Gandhi will release the party's election manifesto at the TMA Pai Convention Hall in Mangaluru. He will also visit Shri Dharmasthala Manjunatheshwara Temple in Dakshina Kannada district. BJP president Amit Shah 's planned road show at Bellary has been cancelled, but he will hold a road show at Koupal in the evening. 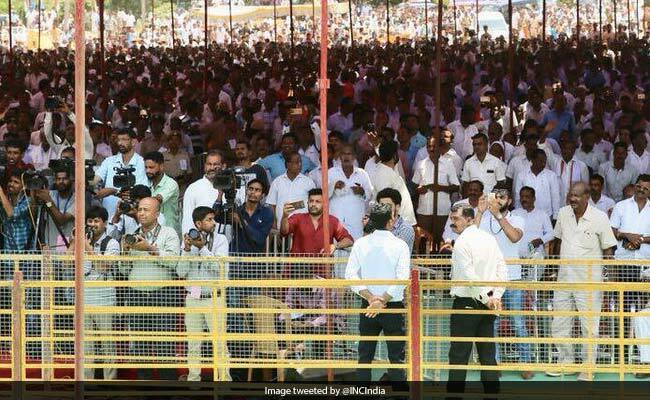 Yesterday Mr Gandhi had held a road show in Ankola, while Prime Minister Narendra Modi gave a speech to BJP party workers in the state via video conferencing. BJP and Congress have been campaigning aggressively across the state over the last month. While the incumbent Congress government in Karnataka is looking to win a second term, the BJP, which was in power till May 2013, is looking to make a comeback. Visuals from Congress President Rahul Gandhi's address at Bantwal district in Dakshina Kannada. 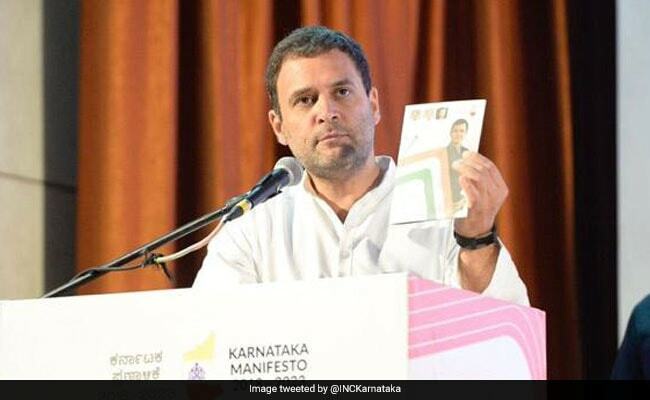 Karnataka Assembly Elections 2018: Rahul Gandhi Says Congress' Karnataka Manifesto Is "People's Mann Ki Baat"
Congress president Rahul Gandhi took a swipe at Prime Minister Narendra Modi as he released his party's manifesto in Mangaluru today ahead of next month's Karnataka elections. "The prime minister likes to tell the people his "mann ki baat". This manifesto contains the mann ki baat of the Karnataka people," Mr Gandhi said. Congress president Rahul Gandhi while addressing a gathering in Bantwal says, "We had promised relief to farmers and we delivered on that promise. Similarly we have delivered on our promise of free education of girls. The Congress believes in delivering as promised." With less than 20 days to go before Karnataka votes in the assembly elections, campaign is hotting up. For the two national parties, it's not just rallies and road shows but increasingly about tweet wars, Facebook likes and WhatsApp forwards. Both Congress and the BJP's have frequently exchanged barbs on Twitter. The BJP Karnataka twitter handle now targets Rahul Gandhi's statement of having fulfilled, "90% of his promises." We are running a thread on how Cong has NOT DELIVERED AS PROMISED. Congress President Rahul Gandhi now addresses a gathering in Bantwal, Karnataka. 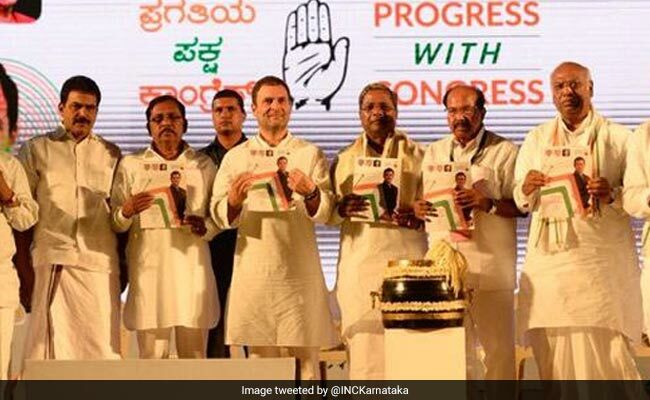 Congress manifesto released by Rahul Gandhi promises to create one crore jobs in five years, if voted to power in Karnataka. 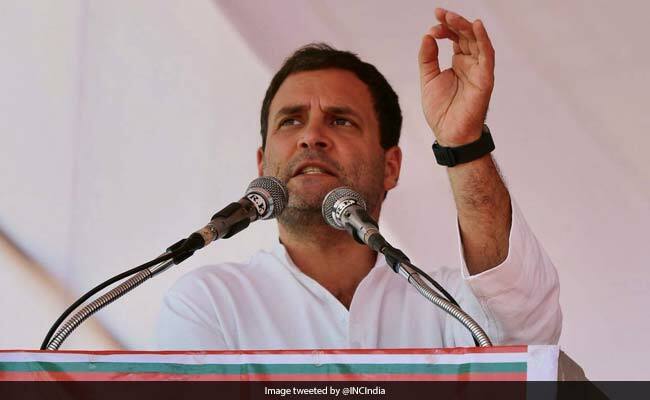 The plane taking Rahul Gandhi from Delhi to Karnataka on Thursday suddenly dipped, listed to one side and shuddered violently despite clear weather, the Congress has said in a complaint alleging "intentional tampering" of the aircraft and calling for an investigation. An FIR or First Information Report has been filed against the pilot. Rahul Gandhi says, "Our manifesto contains the Mann Ki Baat of the Karnataka people." This state won't have a future if every district is not respected and listened to. 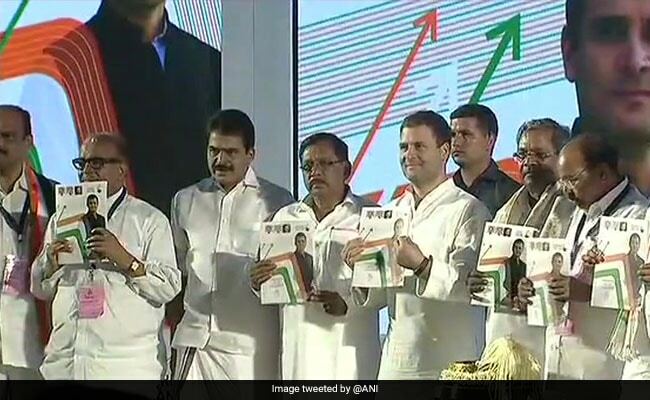 This manifesto carries the voice of the people of Karnataka says Rahul Gandhi while releasing manifesto. "In the last three months, I have travelled to every district of the state and it has been an enlightening experience. I thank you with all the humility. Every other state looks up to Karnataka for direction. I would like to thank the people of the Karnataka that in this difficult time, your dignity has helped the country", says Rahul Gandhi. Rahul Gandhi says, "Our opponents do not respect the culture of Karnataka.PM Narendra Modi of the BJP does not stand up to what he says. " He says, "BJP manifesto is decided by 3-4 leaders. It will be the manifesto of the RSS. I am here to listen to the people of Karnataka. That is the difference between Congress and our Karnataka." Congress President Rahul Gandhi says, "In our last manifesto, 95 percent of things we said have been done." 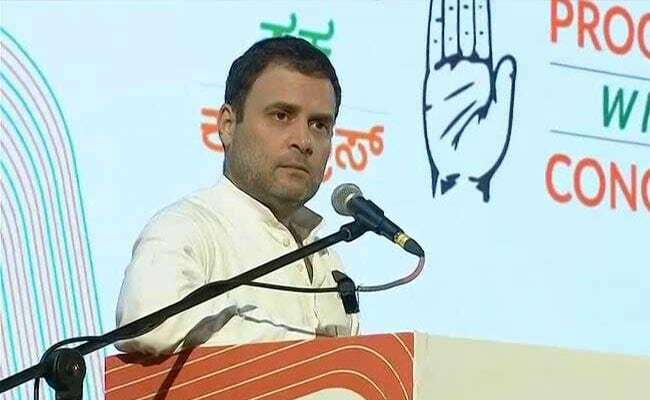 Congress president Rahul Gandhi and four passengers on a chartered flight from Delhi to Karnataka got a major scare on Thursday after the aircraft reportedly developed "multiple faults", triggering a complaint from his key aide to seek a probe to determine if there was any "intentional tampering" of the aircraft." "If Yogi Adityanath comes here, it will be a minus point for BJP," Karnataka chief minister Siddaramaiah predicted. The Uttar Pradesh chief minister is going to campaign in the state next week. 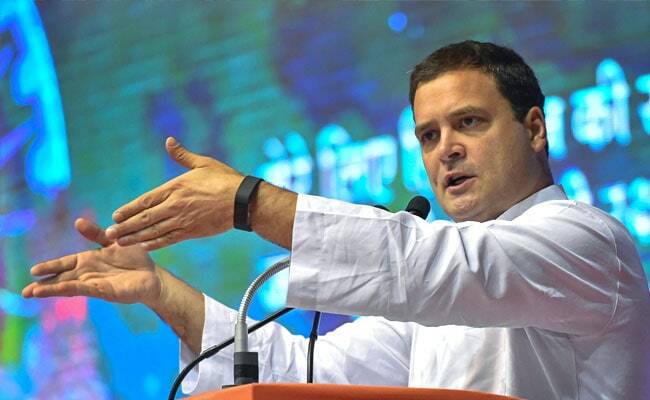 Rahul Gandhi and four passengers on a chartered flight from Delhi to Karnataka got a major scare on Thursday after the aircraft reportedly developed "multiple faults", triggering a complaint to seek a probe to determine if there was any "intentional tampering" of the aircraft. 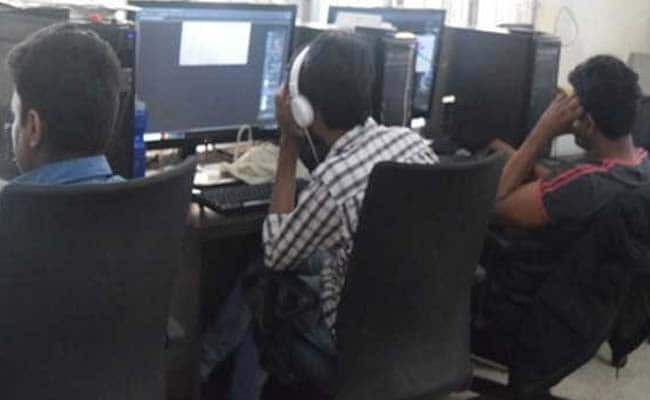 Development, fast paced development, all round development: this is the three pronged agenda for Karnataka that PM Modi told BJP party workers over video interaction. According to the Election Commission, the total number of voters as per the draft electoral rolls stands at 4,90,06,901 (approximately 4.90 crore), however the total number of voters as per the final electoral rolls stood at 4,96,82,357 (approximately 4.96 crore). 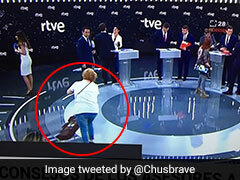 For more information on upcoming election, read here. Social media has been a prominent platform in the campaigns of both the BJP and Congress. Read about the social media war rooms of both parties here.